I got a fire going in the wood stove, and then caught a half hour or so of the Rose Parade on tv before Sue, Beau, and I headed out for a picture taking quest, and hike in the woods. 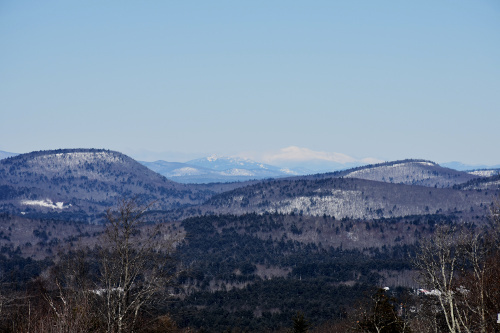 Sue caught this terrific shot of a snow capped Mt. Washington as we crested the ridge on our way out to walk Beau. Sue wanted to check out the area around Marchs Pond along Birch Hill Road. Actually nothing looked interesting, and so she directed me off onto Brienne Road. 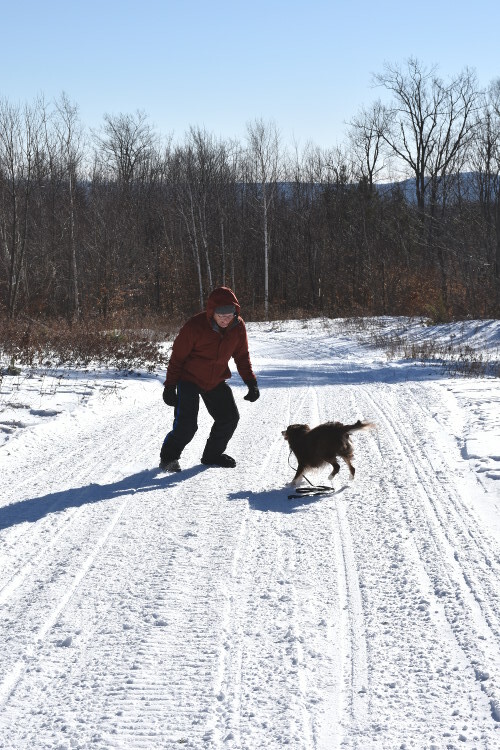 We took that to the end where there was an open parking area by some snowmobile trails. She said there might be a nice view down one of the trails, and so we were off in the negative 10 below zero wind. 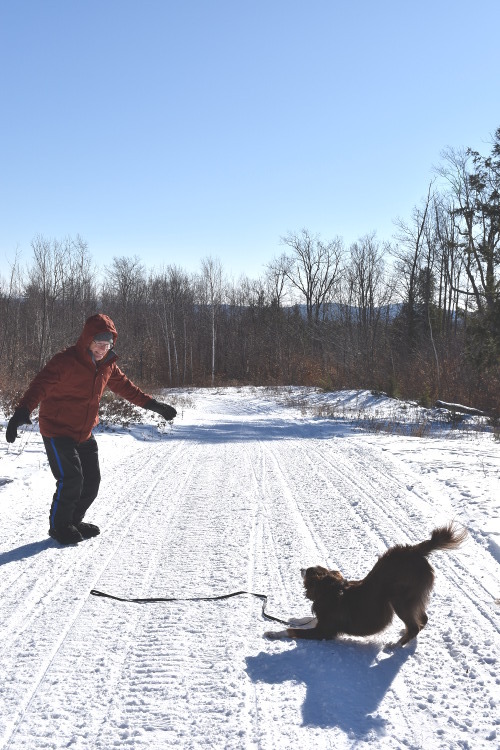 20 below zero with Beau on the snowmobile trail we were hiking along. Having a good time chasing Beau around in the snow. We must have walked almost a mile before the freezing wind won out. I called to Beau, and off we went back to the car. It was a lot tougher trudging uphill and against the wind than it had been heading out. I was pooped out by the time I got the engine going, and glad to be out of the cold. Sue thought it might be nice to wander over to Merrymeeting Lake as a long way back home. The area is so pretty; it's always a joy to drive around just enjoying the beauty of the mountains and woods. After getting home, I got the wood stove going again, and then watched a little of the Rose Bowl: Notre Dame vs LSU. I'm not a particular football fan, but I do try to watch at least part of the games on New Years, Super Bowl, and Thanksgiving. But I had little time to relax! 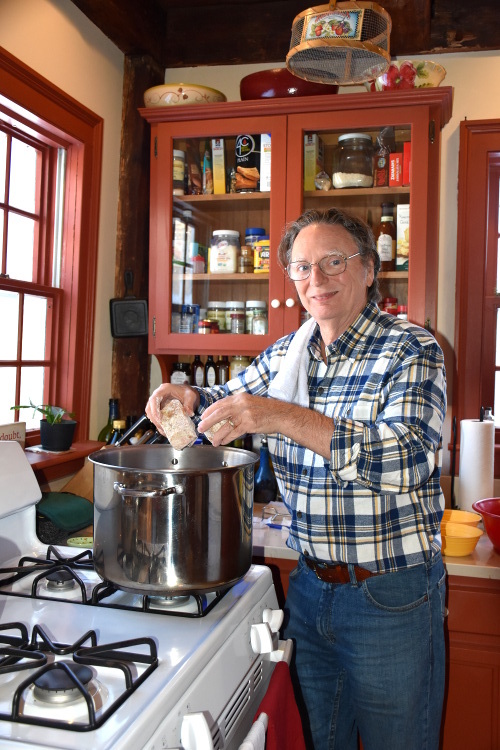 I was cooking my mother's recipe for ox tails in a rich blend of tarragon, rosemary, onions, and almost a bottle of red Zinfandel. It took about 45 minutes to get everything cut up and the meat browned before putting everything onto a simmer for 3 and a half hours. Once that was going, I cut up two big bunches of carrots which I later sautéed with onions, thyme, and tarragon. Browning the ox tails before adding the sauce they would simmer in for over 3 hours. Once I got the ox tails simmering in the sauce, we had a chance to play a few sets of backgammon to start the New Year off. I'd get up every so often to stir the ox tails and throw another log into the wood stove, and refresh our wine. Beau just parked it on the floor by the wood stove. I think he was pretty worn out from the morning hike. After dinner and washing up, Sue couldn't resist taking the following 2 pictures through the kitchen window. 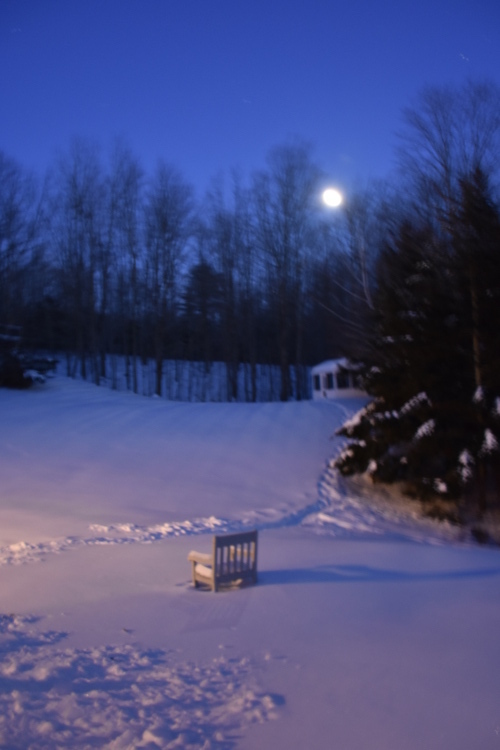 Full moon over the woods behind the house New Years Eve. 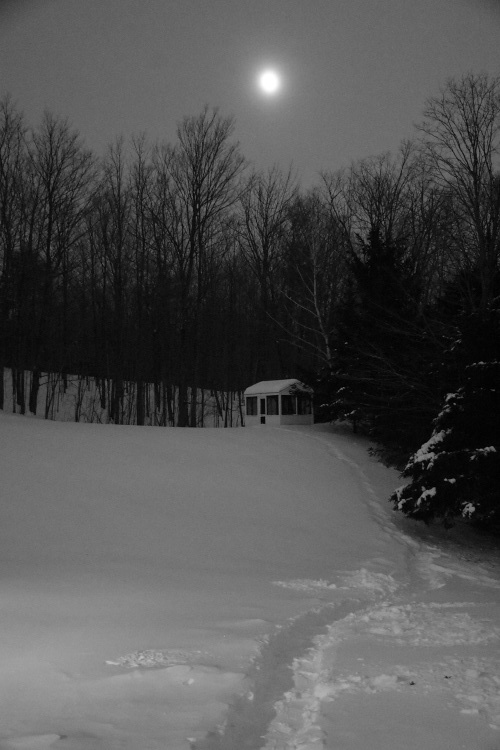 Another view in black and white of the full moon over the woods behind the house New Years Eve. We wound the evening down with the well done 2017 movie, The Glass Castle. But when it was finished, Sue was beat and so went up to bed, while I continued on for an hour or so with an episode of a series I had recorded.